On Wednesday's Talk is Jericho, Chris Jericho outlined the circumstances that led to his decision to sign with All Elite Wrestling with many details from the past year. On Wednesday’s edition of Talk is Jericho, Chris Jericho went into detail about signing with All Elite Wrestling and the circumstances that led to his decision. Jericho had not been under contract to WWE since May 2017, where he won the United States title from Kevin Owens at the Payback event. He dropped the title two nights later to Owens and was taken out with an injury angle. All of Jericho’s future WWE appearances were one-offs without a contractual arrangement. In the summer of 2017, Don Callis contacted Jericho and pitched him on the idea of wrestling Kenny Omega. Callis had begun working for New Japan on the English broadcast team after Steve Corino wrapped up his duties to accept a position at the WWE’s Performance Center. While it was thought to be a longshot of landing Jericho, the timing was interesting as Jericho was intrigued by the idea of putting together a match no one would expect. This coincided with the second biggest combat sports pay-per-view in history with Floyd Mayweather Jr. fighting Conor McGregor in August 2017 and generating approximately 4.3 million pay-per-view buys. A meeting was set up involving Jericho and New Japan officials in New York City at the Royalton Hotel, which Jericho has noted was impressive that they flew to meet him. A deal was struck where Jericho would earn a percentage of the income of new sign-ups to New Japan World for Wrestle Kingdom 12. The result was an increase of 40,000 subscribers by January 4th, 2018 and bringing New Japan World’s total subscriber base to 100,000. Prior to a Fozzy VIP meet-and-greet in Wilkes-Barre, Pennsylvania, Jericho spoke with Vince McMahon on the phone to alert him of the upcoming angle and match with New Japan and said he received McMahon’s blessing. The build towards the Kenny Omega match went very well and the match was the strongest on the show. Jericho only had a deal for the one match but pitched Gedo on shooting an angle at New Year Dash the following night involving Hiroshi Tanahashi. Gedo agreed to the angle but suggested he do it with Tetsuya Naito and Jericho left Japan without an agreement for any future dates, but the match was set up. After New Year Dash, McMahon reached out to Jericho asking about the angle and was not aware Jericho would be doing anything beyond Wrestle Kingdom with New Japan. Jericho explained he didn’t have a deal with New Japan, and it was left open-ended with the promotion and doing more business together. This coincided with the WWE seeking out all major names for the 25th-anniversary of Raw special in January 2018. Jericho was asked to do the show but requested a backstage segment and they came up with the bit involving Elias. In January, Jericho also came to terms with New Japan on a three-match deal that would kick off with the match with Tetsuya Naito at Dominion in June, a title defense against Evil in November at Power Struggle and culminate with the Naito rematch at Wrestle Kingdom the following year. Jericho’s agreement with New Japan didn’t preclude him from working with WWE as he received an enormous offer to work the Greatest Royal Rumble card in Saudi Arabia in April. Initially, he was scheduled to face The Undertaker in a casket match, and it became comical with the frequent changes in announcements from the company before settling on The Undertaker vs. Rusev and Jericho being put into the 50-man battle royal. Jericho added that McMahon was not happy he signed the deal with New Japan, viewing them as a competitor because of their television deal on AXS TV. Jericho was told that the Crown Prince had requested the match involving The Undertaker and Rusev, but Jericho viewed it as an opportunity to have a prominent match on the show and placing a big a spotlight on a non-contracted performer with New Japan. Later in the year, Jericho sent a pitch to McMahon for a match at SummerSlam with Seth Rollins that would pit the WWE’s Intercontinental champion against New Japan’s IC champion and never received a response. As the summer continued, Jericho was introduced to Tony Khan through his manager Barry Bloom. Once the plan was made for Jericho’s appearance at “All In”, the logistical hurdle was getting Jericho from Chicago to Kansas for a Fozzy show that night. Jericho revealed on the podcast that he receives a private jet from Khan to get from one destination to the other. The WWE expressed interest in using Jericho at the Crown Jewel event in November, which was scheduled for a Friday and Jericho was set to wrestle Evil in Osaka that same weekend. While difficult, Jericho believed he could do both, but the WWE never got back to him. That was when he made the deal to appear at “All In” and he showed up on a non-WWE event for the first time in the U.S. since joining the company in the summer of 1999. Jericho had a four-hour meeting with Khan and described the money offer as “NHL level” without elaborating into what that meant beyond the assumption that the amount was incredible. In November, Jericho had a Fozzy concert in Toronto at the Rockpile and he met with the officials at Impact Wrestling. Jericho had open communication with Impact because he was the one that recommended Scott D’Amore and Don Callis to Leonard Asper and Ed Nordholm of Anthem Sports the prior year. Jericho confirmed in this podcast he received an offer from Impact and did contemplate doing dates with them, mentioning talent like Sami Callihan and Rich Swann he would have loved to have worked with. In the end, he chose All Elite Wrestling because they showed him a level of respect and also have big expectations for him that will be critical to their success. He negotiated with the WWE up until a few days before the rally in Jacksonville and officially signed his All Elite Wrestling contract on Monday, January 7th. He did alert Vince McMahon that he was signing with the group and he wouldn’t elaborate on their final conversation other than noting their parting was “amicable”. He added there was no ill-will on his part that they moved his profile to the alumni section of the WWE website or removed his image from the opening signature on television stating it was business and made no sense to promote someone with another company. 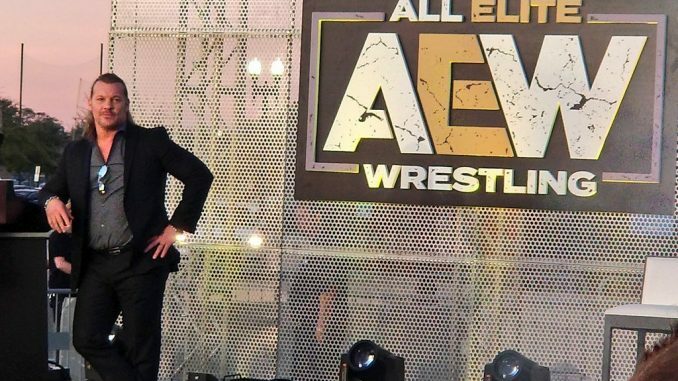 Jericho confirmed that his deal with All Elite Wrestling is exclusive with the exception of New Japan Pro Wrestling, who he can strike his own deal with and continue working for. The deal is for three-years with the promotion running their first card May 25th in Las Vegas with “Double or Nothing”.